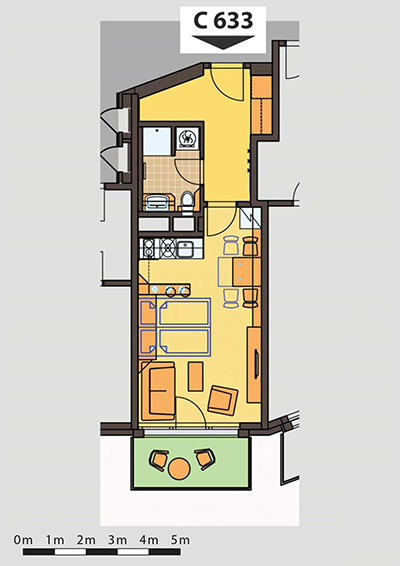 One bedroom apartment for rent, near the midtown of Prague, fully furnished, with a balcony. High quality, comfortable living will provide an enclosed area, Albertov Rental Apartments. 1 bedroom apartment of 35 m2 is very well equipped. Evidenced by the wooden floors with underfloor heating, large french windows make this apartment airy, sunny and its modern furniture, made to the right measurement. A comfortable couch with an armchair serves for rest and relaxation. High quality blackout curtains are certainly appreciated not only during the hot summer months but also during those “sleeping in late” days. The pleasant moments during those warm summer days can be spent on the spacious terrace overlooking the area and the city of Prague panorama. For more room the apartment is equipped with a practical foldaway bed with a comfortable anatomical mattress. The bar separates the living room from the kitchen. Fully equipped kitchen is furnished with modern appliances such as a Dishwasher, electric oven, hob, hood, microwave, and a refrigerator. For entertainment the apartment has a satellite television with many Czech and international channels and fast WI-FI connection to the internet. The bathroom is equipped with pleasant underfloor heating, shower stall, sink with LED lighting, washing machine, dryer, and a toilet. The interior of the apartment is furnished and functional in every respect. This exceptional, bright, and modernly furnished apartment with a balcony is located on the 6th floor of the 3rd building complex in Albertov Rental Apartments, this complex will provide you more privacy than a hotel. 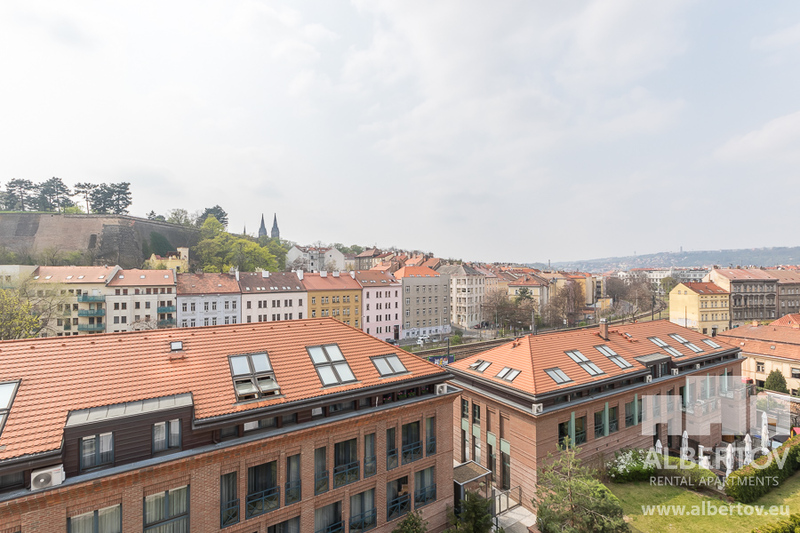 The location in Prague 2 will ensure an excellent access to downtown but also a tranquil environment for both sports and relaxation. Convenient, comforting, private, is living in Albertov Rental Apartments.